Macclesfield Masters Swimming club is a rarity in the world of swimming as we are a club solely devoted to Masters swimming (18+). We are not just the senior part of an all age group club although, we enjoy close links with other age group swimming clubs in the area. 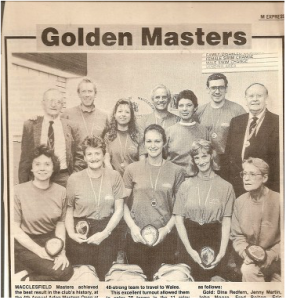 It started formally in January 1987 when a number of swimmers who had been swimming together in public swim sessions in Bollington and the old Green Street baths in Macclesfield, decided to set up a Masters Club and affiliate to the ASA. The idea was to enter competitive teams into ASA run galas and this they did with some distinction over the years. Under the chairmanship of swimming stalwart, Herbie Webster, teams swam in galas from Southport to Bangor. The latterwas always a favourite meeting and strong squads entered each year for the Arfon Masters gala. Individuals from our club also entered national events such as the GB Nationals, European and World Championships. Swimmers have used international masters events to see the world and over the years some of our members, have done exactly that. Examples include Hilda Silcock, Dorothy Wilkie, Eva Palmer and Margaret Rouse, whom have entering World and European championships from Perth (the Australian one) to Montreal, and various pools in Europe. Dorothy however did not have to travel further than Liverpool to capture the Women’s H age group world record for the 1500m freestyle in 1994. In recent years the club has changed tack a little. While training is mainly targeted at competitive swimmers, we have welcomed people who come with other aims such as just keeping fit, or as part of their training for other aquatic sports such as Water Polo, Triathlon, and Canoeing. Open Water Swimming has also become popular with our members and many now swim at a local open water lake in Holmes Chapel. We pride ourselves on being a friendly and well run club and we have the Swim 21 award – the swimming quality kite mark and the club still retains the essential character established by our predecessors.